During the trolley era, Freeport had some limited, privately-operated bus service to its ferries.1 Otherwise, before the 1920s, mass transit in Freeport consisted of the Long Island Railroad, which continues to serve the village, and four streetcar lines, all of which were ultimately discontinued and supplanted by buses as the automobile became the main focus of transportation. 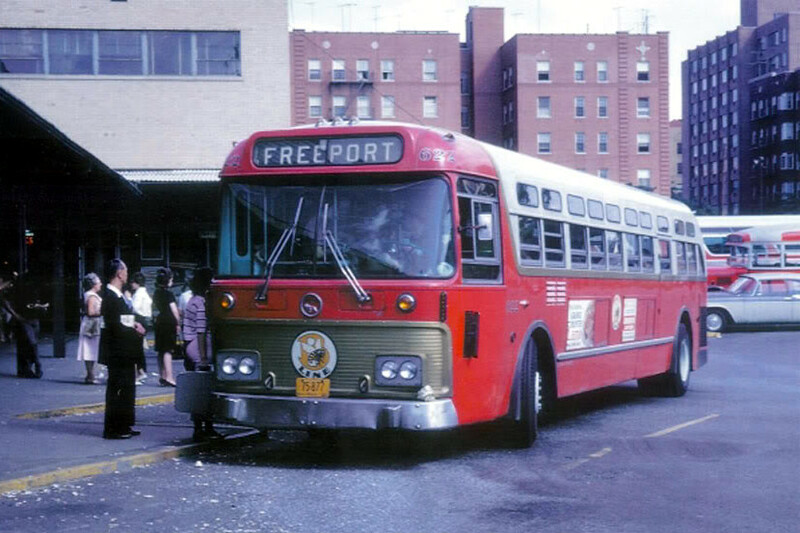 Until 1973, bus service in Nassau County was divided among various private operators, with Freeport served, for instance, by Bee Line, Hempstead Bus Corp., Star Bus Lines, and Roosevelt Bus Line. In that year, however, as the operators faced financial collapse2, most of the bus routes were taken over by the county3, and the Metropolitan Transportation Authority (MTA) ran them as the Metropolitan Suburban Bus Authority (MSBA) until the system was re-branded MTA Long Island Bus in the mid 1990s4. In 2011, after years of underfunding by the county5 and amid a push by county officials for privatization, the MTA terminated its contract to operate Long Island Bus. It was ultimately privatized under the transport operator Veolia Transdev and reconstituted as Nassau Inter-County Express (NICE) in 2012. Freeport has the second-highest concentration of bus riders in Nassau County, surpassed only by Hempstead6, and is a major hub of the county's bus system. In 1899, avoiding the regulatory obstacles to building trolley lines, the Nassau Motor Coach Co. was established and planned to set up a transit network throughout the county using electric buses7, though no service ever seems to have materialized. In 1918, following the bankruptcy of the Freeport Rail Road, the Great South Bay Ferry Co. ran a bus line along South Grove St. to its ferries from the New York and Long Island Traction Co. trolley on Atlantic Ave. and the train station8, though it ultimately took over both the Freeport and Seashore Municipal Rail Roads and ran them itself9. Bus #8 from the Freeport Bus Corp. 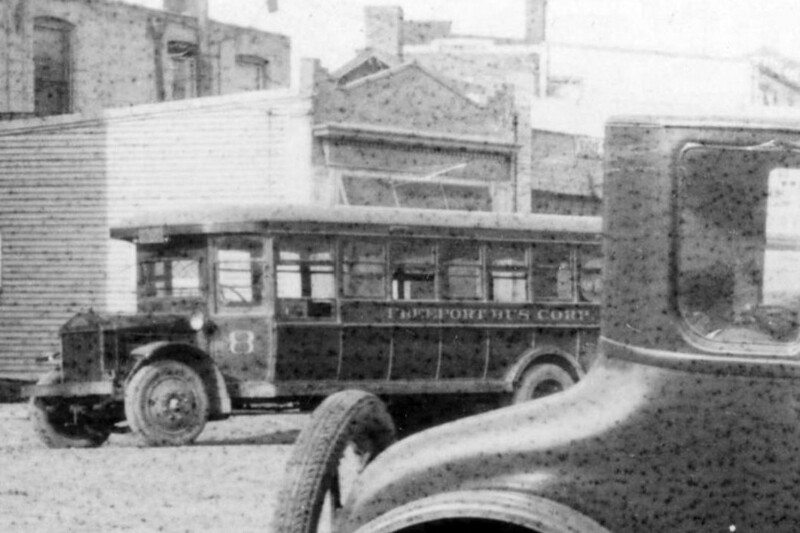 This photograph, most likely taken in the 1920s around when trolley service was ending, shows a vehicle from the Freeport Bus Corp. The company's fares were accepted in the form of tokens10. 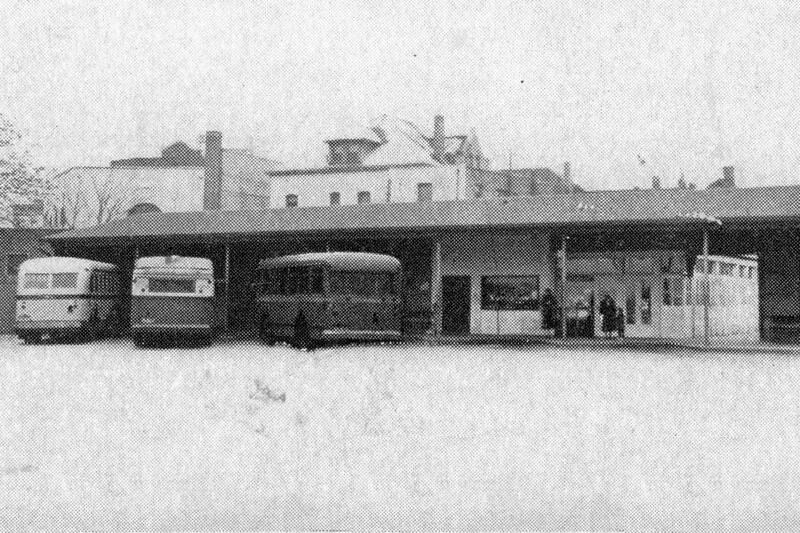 This photograph shows the front of Freeport's bus terminal, which used to stand on the west side of Henry St. between the train station and Sunrise Highway. In 1944, it was served by over 300 buses per day and used by almost 22,000 riders11. In 1948, bus routes were proposed from the terminal through the northeast section of the village and from Freeport to Hofstra College, now Hofstra University, but these were never implemented at least in part due to the results of public surveys on the matter12. 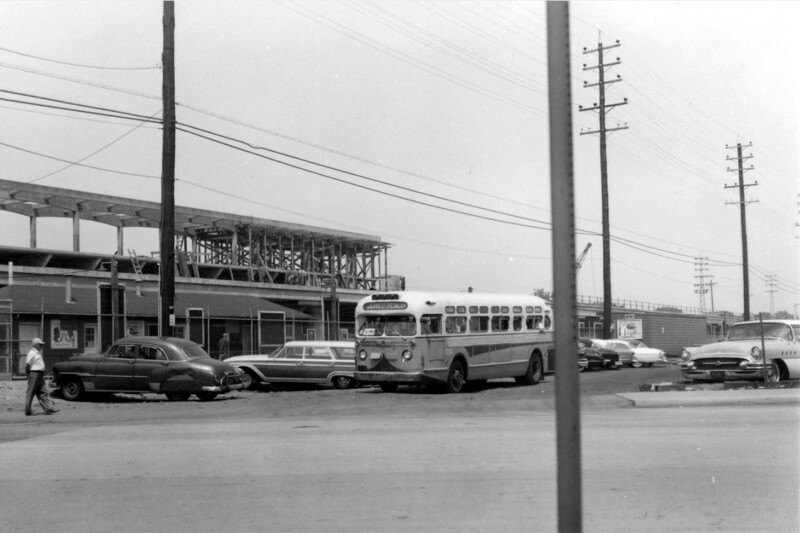 The terminal was shut down in 1957, and bus stops were established throughout the surrounding area to replace it—including the Newton Blvd. stop where the replica sign in this exhibit would have originated—while the corresponding bus lines were rerouted13. The train station wound up acting as Freeport's bus terminal, the buses pulling alongside it, similar to what had been called for and rejected under the Midtown Plan for the railroad grade eliminations. 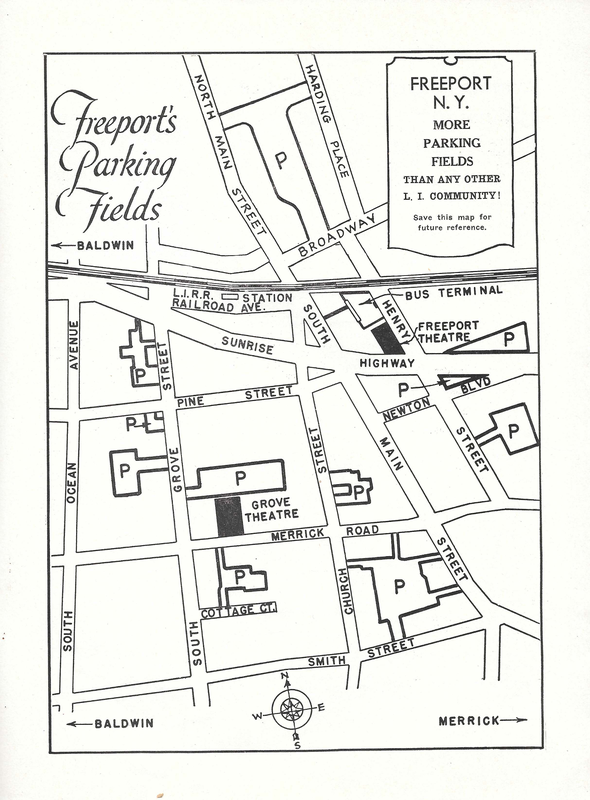 The parking map above, from before the elevation of the railroad tracks and the elimination of Freeport's grade crossings, shows the area around the train station and the location of the bus terminal (upper center) and other landmarks. Today, the former site of the facility serves predominantly as parking, reviving another curtailed aspect of the Midtown Plan, and houses ATMs and a drive-through for Chase Bank. The banking facility was first established by the Long Island Trust Co. in 196114, relatively soon after the terminal closed. The rear of the Freeport Bank building, later housing the Long Island Trust Co., and now a Chase branch, is visible in the photo of the terminal behind it and to the left15. Taken from Henry St., this photograph shows the south side of the Freeport train station in 1960 during the grade elimination project. In front of the station, a Bee-Line bus, predecessor of the current n88, is apparently departing for Jones Beach. Before the takeover by the MTA and the formation of the MSBA, Bee Line operated bus routes throughout Long Island and New York City16. This patch is from a Hempstead Bus Corp. driver's uniform. The company ran service in Freeport along North Main St. to and from the train station, similar to the route of the current N40. The patch would have been attached to the upper part of the sleeve of the driver's jacket17. 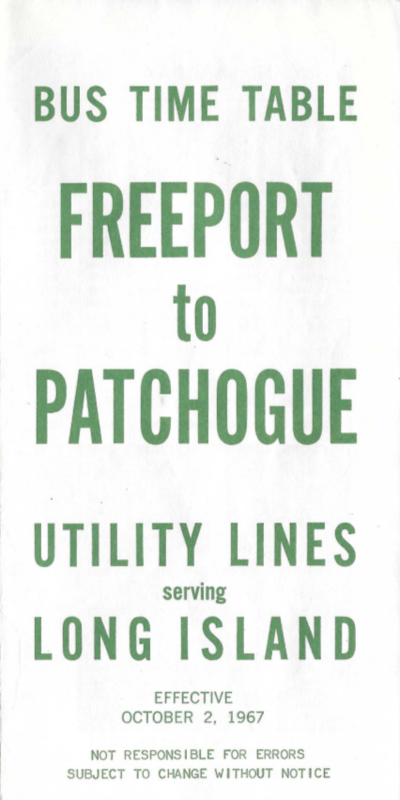 This timetable shows the service offered by Utility Lines, a subsidiary of Bee Line, between Freeport and Patchogue. Currently, no single bus line runs this whole distance, but the service would have been roughly equivalent to a combination of the current n19, S20, and S40 (the latter two, denoted by an S, being Suffolk County routes). The timetable also advertises Utility Lines' charter service. Star Bus Lines was another of the private operators running bus service in Nassau County before consolidation under the MSBA. The bus shown here is older, but the photo was probably taken in the 1960s. 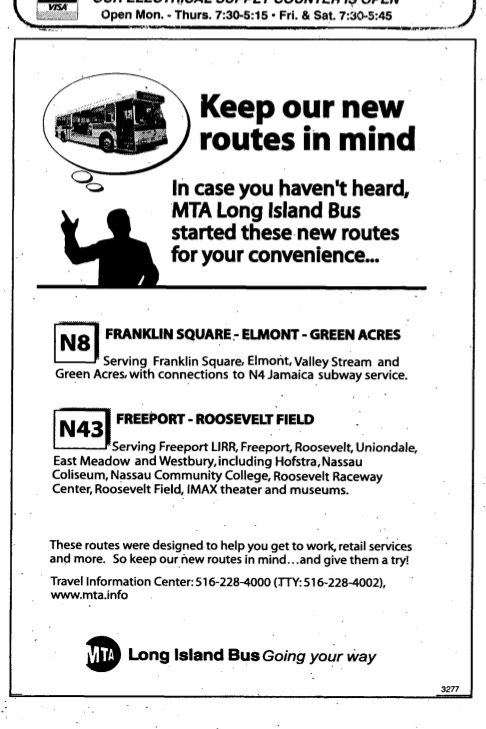 The bus most likely ran on a route through Freeport, Roosevelt, and Bellmore that has no present-day equivalent, though most of it would have followed the southern leg of the now-defunct n45. The route of the bus depicted was probably the predecessor to the current n4, which runs between the Freeport train station and the intersection of Archer Ave. and Parsons Blvd. in Jamaica, Queens. The photo most likely dates to the 1960s. The MSBA had originally planned to take over bus operations in Rockland, Suffolk, and Westchester counties as well18 but for the most part never extended beyond Nassau's bus routes. Despite being renamed Long Island Bus and then supplanted by NICE, vestiges of the MSBA still exist, such as in the form of the MSBA Employees Federal Credit Union. The standard MSBA "M" logo, derived from the original MTA logo, had numerous variations when it appeared on buses, signs, uniforms, timetables, and other materials over the years, though it looked substantially as it does in this drawing. The blockier logo, with the full MSBA abbreviation, appeared on the sides of buses later on, also with variations. Based on a diagram in: Metropolitan Suburban Bus Authority. "Nassau County Bus Map." September 1989. 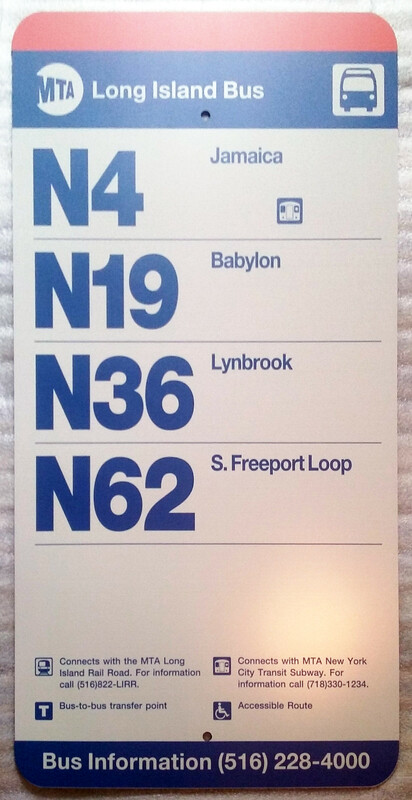 This graphic shows approximately how a typical MSBA bus stop sign would have appeared, in this case for route N36 (now defunct), bound for Freeport. Please see the BusTalk U.S. Surface Transportation Galleries for a photo of a Jones Beach-bound MSBA bus at the Freeport train station. The above photograph from June of 1975 shows an MSBA bus set up for route JB62, which ran seasonally between the Freeport train station and Jones Beach, apparently about to take on passengers. Similar service is provided today by the n88. Most likely, the bus itself was formerly owned by one of Nassau's private bus operators. Also note the great similarity between how the train station area looked then and its appearance now. Bus Accident on Merrick Rd. 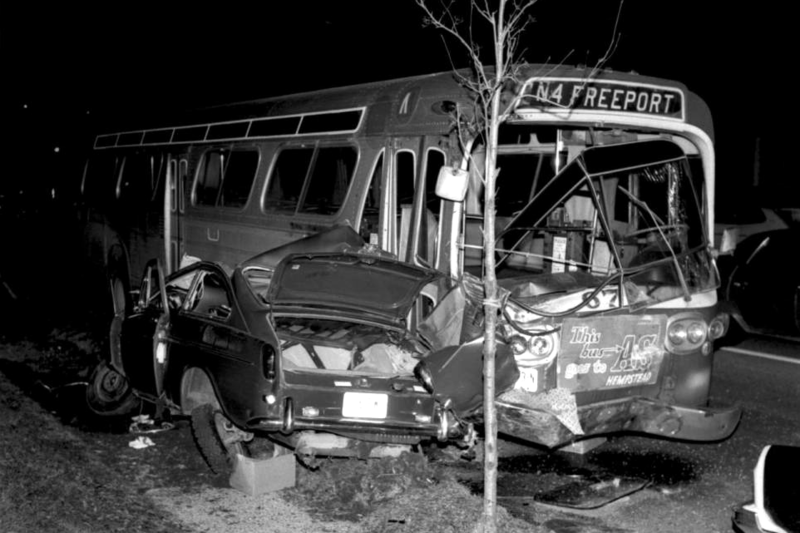 There have been a number of serious accidents over the years involving Nassau County buses, such as in 200321, when a bus slammed into Hempstead Transit Center and caused multiple injuries, including an amputation; in 201222, when a bus went out of control and hit a house, killing one person; and in 2015, when a bus traveling through Queens struck and killed a pedestrian23. Please see the BusTalk U.S. Surface Transportation Galleries for a photo of an articulated bus at the Rockville Centre Depot. This photograph from July 2, 1982 shows an articulated MSBA bus set up for route N4, which still runs between Freeport and Jamaica. 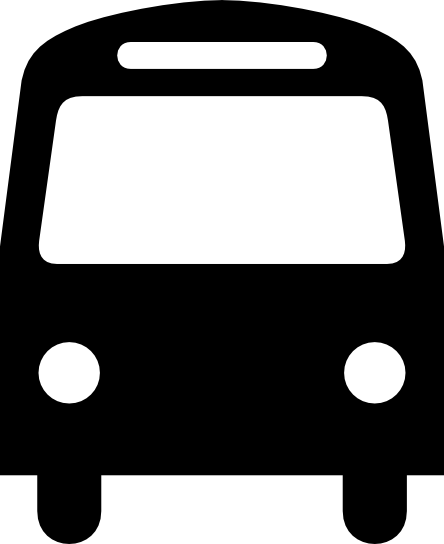 This type of bus has an articulating joint near its center that allows the bus to be longer and thus to carry more passengers. The Rockville Centre Depot was originally owned by Bee Line and later taken over by the MSBA24. After a hiatus of many years, service by articulated buses only became available again on Long Island in April of 2017. However, the Rockville Centre Depot was shut down at the same time with NICE facing a lack of funding and reduced need for the facility after multiple route eliminations. Please see the BusTalk U.S. Surface Transportation Galleries for a photo of buses parked at the Mitchel Field Depot (the one discussed below is second from the top). This photograph shows two MSBA buses parked at the main bus depot on Commercial Ave. in Garden City in March of 1990. One is set up for route N40, which still runs between Hempstead Terminal and the Freeport train station, and the other for route N32, which runs between Hempstead Terminal and Far Rockaway, Queens. Electronic destination signs not yet implemented, these buses still used the older-type roll signs, which had the names of routes and destinations printed on sheets of canvas wound on rolls that could be advanced to display different information. Before this, many buses used placards that would be swapped by the driver depending on the route and destination. Also visible on the side of the front N40 bus is one of the last tobacco advertisements displayed by the MSBA. The MTA banned such advertising on any of its services in 199225. The MTA used to offer various combined-fare bus and train service on Long Island, allowing passengers to use one ticket for the train and a connecting bus. This timetable from 1992 was for service offered from the Amityville train station on the Babylon Branch of the Long Island Railroad north to Farmingdale and Huntington on the N98 (now defunct) and S1 respectively. At this time, the bus fare was $1.50, and tickets, coins, dollar bills, and New York City transit tokens were accepted as payment. As of 2017, the standard fare is $2.75, and payment can be made by coins, MetroCard, or smartphone app. In addition, one package still available from the railroad includes a ticket to be used on NICE's n88 to go from Freeport to Jones Beach. A PNG file of the sign graphics is also available. The N4 and N19, now written by NICE with lowercase n's, still operate and serve the same stop, while the N36 and N62 have been discontinued. These are schedules for Long Island Bus routes N45, N73, and N74 shortly before service was discontinued. 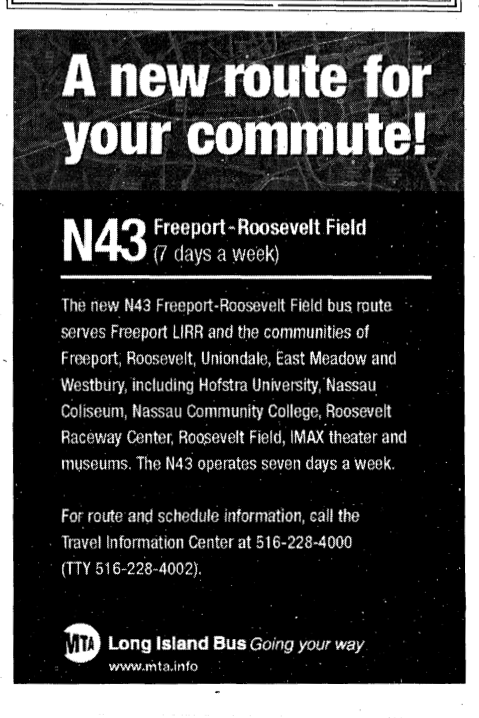 While none of these routes served Freeport directly, the N45, terminating along with the N50 in nearby Bellmore instead, followed much of the same route as the N43, which runs between Freeport and Roosevelt Field Mall. The N73 and N74 were discontinued in 2016. See also lists of Long Island Bus schedules for 2002, 2004, and 2011. These are facsimiles of two ads placed by the MTA in the The Leader in the early 2000s. The first one, as it appeared on March 13, 2003, announces the creation of route N43, while the other, as it appeared on March 4, 2004, further promotes it and the recently-created N8, the latter having since been discontinued. 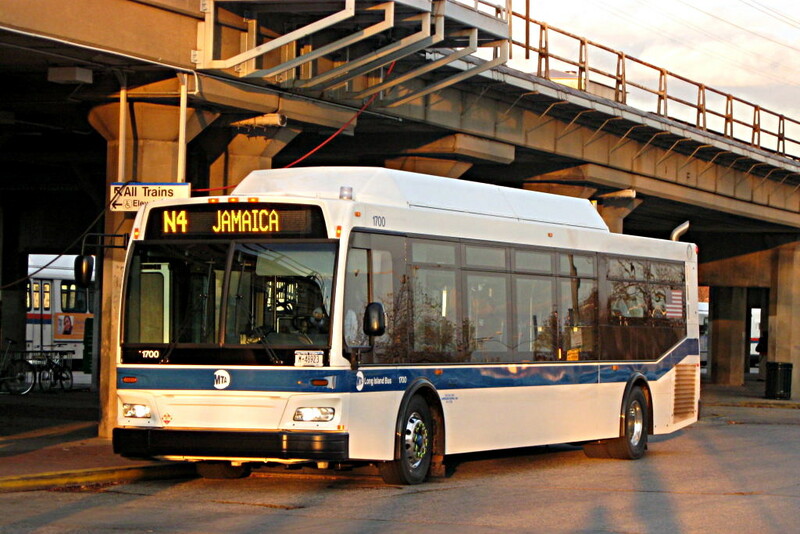 This photograph shows an N4, bus number 1700, stopped at the Freeport train station on November 17, 2008, when Long Island Bus was still operating. 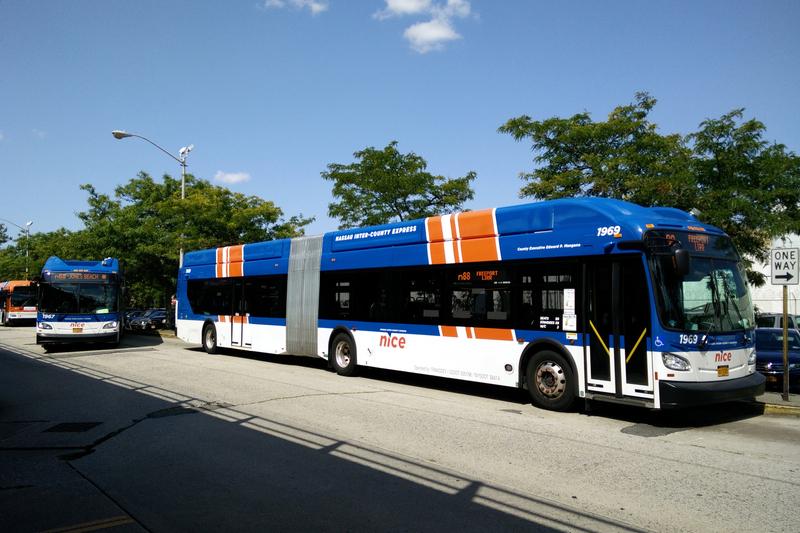 The 1700-series buses were the first to drop the blue, orange (Nassau County's official colors), and white paint scheme for the plainer blue and white of the MTA's New York City buses. They would ultimately be skinned over with orange vinyl when the system was privatized and re-branded NICE in 2012. Please see the BusTalk U.S. Surface Transportation Galleries for a photo of passengers boarding a Jamaica-bound N4 bus. This photograph shows passengers boarding an N4 bus, with the original color scheme, for Jamaica at the Freeport train station in 2009. This bus, an Orion V, was one of the older vehicles in the Long Island Bus fleet and probably one of the system's first to be powered by compressed natural gas instead of diesel fuel. See also this video of Long Island Bus operating around the Freeport train station in 2011. The original of the bus stop sign recreated at the beginning of this section is also visible starting around 4:40. The first photo, taken on May 25, 2017, shows a sign on the platform of the Hicksville train station that still refers to the MSBA. 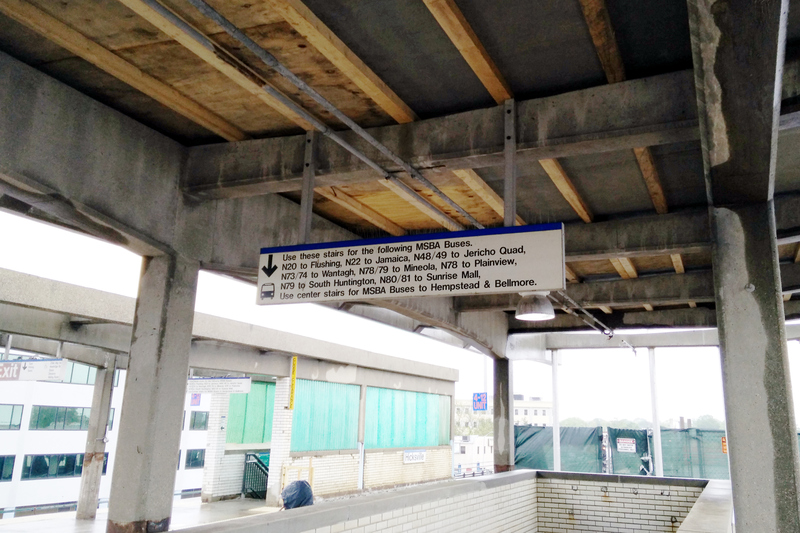 The other photo, from May 26, 2017, shows one of several similar Long Island Bus signs that still hang on the columns along the north side of the Freeport train station. Both signs also refer to routes that no longer exist: the N36, N62, N73, and N74. Unlike those of Long Island Bus, NICE's schedules were originally printed in full color on glossy paper, the front of an n43 schedule shown here at actual size. However, NICE quickly reverted back to a more basic format. Please see BM5 via Woodhaven on flickr for a photo of a Freeport Community Shuttle mini bus. 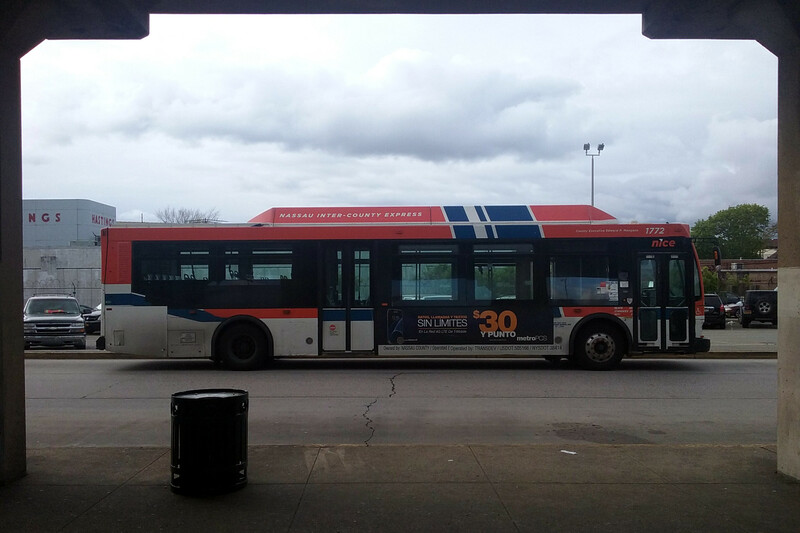 On NICE mini buses, the default color scheme of orange with blue accents is reversed, such as on the Freeport Community Shuttle shown here on February 21, 2017. About nine months after the n62 was eliminated amid January 2016 cuts to NICE, it was reinstated as the shuttle using mini buses. A proposal to again eliminate this route, among others, was rejected by the Nassau Bus Transit Committee in December 2016, but another vote was called soon after, and most of the routes in question, including the Freeport Shuttle, were ultimately eliminated on April 9, 2017. Leading up to that date, Freeport was one of four locales in Nassau County to have a bus route contained totally within its limits, the others being nearby Rockville Centre and Long Beach as well as Glen Cove. The cities of Long Beach and Glen Cove run their own municipal bus systems, and around the early 1970s, the Town of Hempstead also ran its own seasonal bus service27. 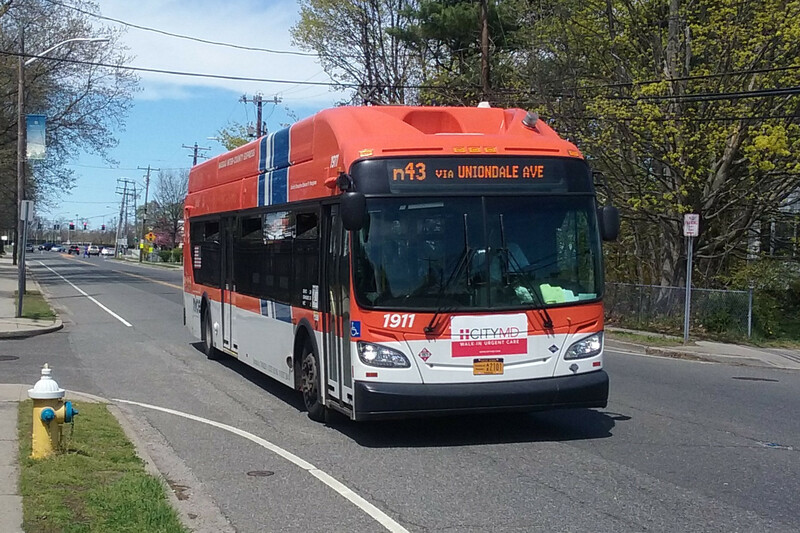 This photograph taken near Hofstra University shows an n43 bus traveling down Uniondale Ave. from Roosevelt Field to Freeport on April 23, 2017. As of that date, the bus shown, a New Flyer Industries XN40, was the newest model of non-articulated, full-size bus in NICE's fleet. Previously, all the full-size buses used by both NICE and Long Island Bus were manufactured by Orion International, but the company shut down in 2013. This NICE bus was parked on the north side of the Freeport train station on May 7, 2017, part of the trestle visible around it. Notice its orange covering is torn away in places, revealing the MTA color scheme from when the vehicle was in service under Long Island Bus. The photo above shows two buses set up for route n88 on the north side of Freeport train station on August 26, 2017. The one in the front is parked, having apparently just completed a run from Jones Beach, and the one in back is pulling up to pick up passengers just ahead before departing for the beach. 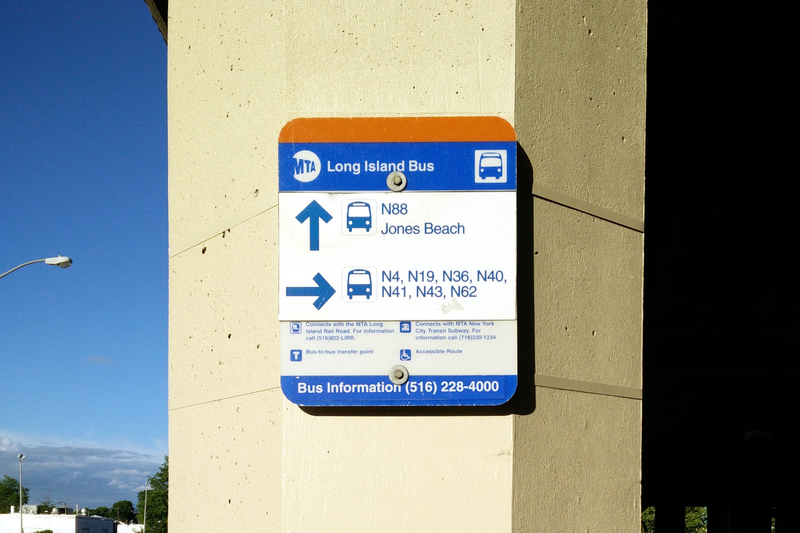 Since the days of Long Island Bus, the Jones Beach route displayed a graphic of the sun on its destination signs, probably the only instance of them displaying anything but text. Comparing the number of buses arriving in Freeport under Long Island Bus in 2011 to those under NICE in 2017, service on the n4 was slightly greater under Long Island Bus during the week but greater under NICE during the weekends. For weekdays, NICE also reinstated express service, which had been eliminated by the MTA. NICE cut service on the N19 by more than half during the week and eliminated it on weekends. It also completely eliminated the N36 and N67 and later the Freeport Shuttle. Service on the N40/N41 was greater weekdays under Long Island Bus but approximately the same under NICE on weekends. Service on the N43 increased slightly under NICE all days. NICE also eliminated most weekday service on the N88 and slightly increased it on weekends. 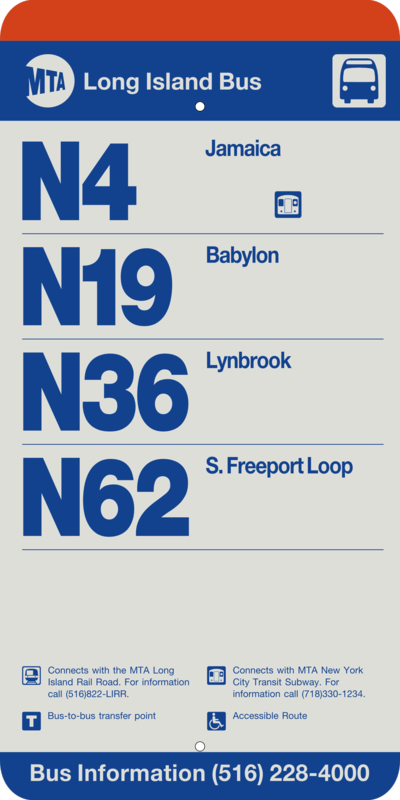 The MTA, finally, had already eliminated the N67 in 2010. Looking at all weekly runs in aggregate, there was about 22% more service under Long Island Bus. Data is based on the latest available schedules for Long Island Bus and NICE as of May 2017. 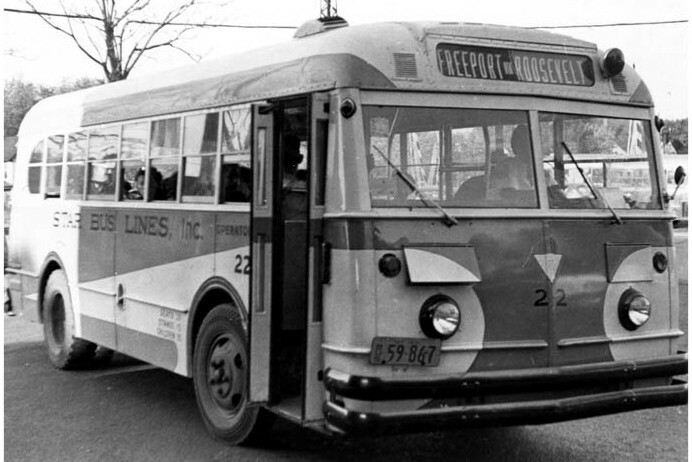 These three maps illustrate how bus-route coverage in Freeport has changed since 1960. Most notably, while their exact paths have varied, Freeport buses have largely followed the same routes for decades, though cuts to service have more recently left the southern half of the village with no coverage at all. No routes that ran totally outside Freeport are shown. This badge was used to show the driver who wore it was legitimately authorized to operate the bus and to identify him by ID number. 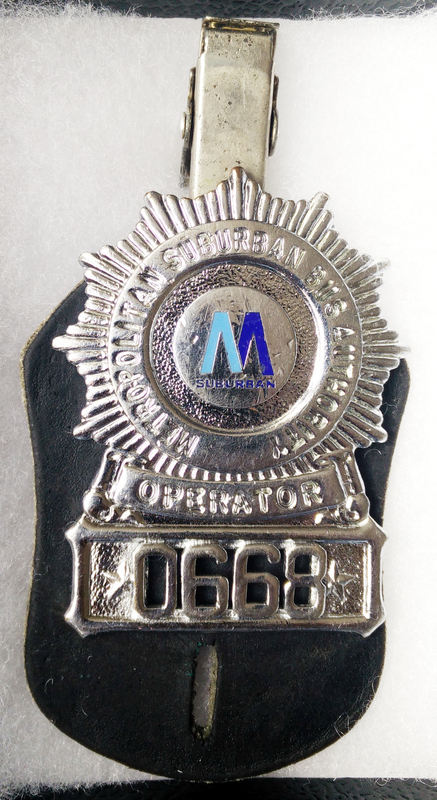 MSBA dispatchers wore a similar badge, but it was gold in color28. Above are vintage bus tokens, obverse and reverse, from some of the private operators that ran service on Long Island. From left to right are tokens from Rockville Centre Bus Corp. (based in Rockville Centre), Long Beach Bus Co., Inc. (based in Long Beach), and Jerusalem Ave. Bus Line, Inc. (based in Hempstead). "Freeport." The Nassau Post. 6/7/1918. p. 5 NYS Historic Newspapers. "Bus Co. Quits Farmingdale Route." Farmingdale Observer. 8/19/1971 p. 1; "MSBA: A Convenient Alternative." The Bethpage Tribune. 1/13/1977. p. 6 NYS Historic Newspapers. "Caso's Corner." The Helm Independent Review. 7/13/1973. p. 8 NYS Historic Newspapers. McKinley, James C. "What's in a Symbol? A Lot, the M.T.A. Is Betting." The New York Times. 8/28/1994. Infotrac Newsstand. Madore, James T. "Nassau County owes more than $40 million." Newsday. 2/16/2008. Infotrac Newsstand. "Motor Coach Company." Nassau County Review. 3/24/1899. NYS Historic Newspapers. "New Bus Line from Depot to the Ferry Dock." Nassau County Review. 5/3/1918. p. 4; "New Bus Line from Depot to Ferry." Nassau County Review. 5/10/1918. p. 8 NYS Historic Newspapers. "Freeport Trolley Sold." The Nassau Post. 7/19/1918. p. 1; "Ferry Line to Take Railroad." Nassau County Review. 1920-04-02 p. 1; NYS Historic Newspapers. Token Catalog. FREEPORT BUS CORP. (TC-439945). "To Take Grade Elimination Soon." The Leader. 11/25/1948 p. 1 NYS Historic Newspapers. Freeport Board of Trustees. Minutes of a meeting held on 2/18/1954. Freeport Historical Society collection. "Long Island Trust Opens New Drive-in Bank Next to Freeport L.I.R.R. Station." The Leader. 8/3/1961 p. 3 NYS Historic Newspapers. New York Heritage Digital Collections. Freeport Historic Photographs. "Accident on Merrick Road." Bee Line timetable. Summer 1932. Freeport Historical Society collection. eBay user "lastcenturyjunk." 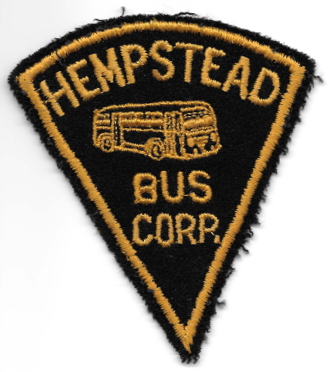 "Hempstead Bus Corp Long Island New York Bus Driver Patch c 1946." August 2017. "Purcell Calls Auto Tax Punitive." The Leader. 1/31/1980. p. 8 NYS Historic Newspapers. New York Heritage Digital Collections. Freeport Historic Photographs. "Municipal Bus Terminal." "Woman Loses Leg in L.I. Bus-Crash Horror." New York Post. 2/20/2003 p. 23 Infotrac Newsstand. Sandoval, Edgar and Shane Dixon Kavanaugh. "Bus crashes into house on Long Island, killing boy." New York Daily News. 11/28/2012. Bult, Laura and Joseph Stepanksy. "Bus driver doesn't hear pleas, crushes woman to death in Queens: witnesses." New York Daily News. 1/30/2015. Kacharaba, Brian. "Rockville Centre bus depot shuts down." LI Herald. 4/13/2017. Zane, J. Peder. "In Surprise, M.T.A. Bans All Tobacco Advertising." The New York Times. 6/27/1992. Infotrac Newsstand. Vieser, David E. "Bus Talk." The Leader. 7/22/1982. p. 16; Vieser, David E. "Bus Talk." The Leader. 8/12/1982. p. 16; Vieser, David E. "Bus Talk." The Leader. 8/26/1982. p. 20 NYS Historic Newspapers. "Town of Hempstead Bus Schedule" The Helm Independent Review. 7/8/1971 p. 8 NYS Historic Newspapers. eBay user "iconpix." "Vintage Metropolitan Suburban BUS Authority DISPATCHER # 17 Badge Long Island NY." May 2017.